Hey, are you tired of that java your simple drip coffee maker has been churning out? 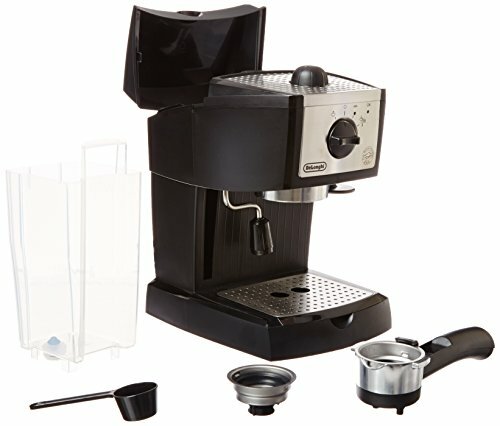 Finally looking to make the upgrade to an espresso maker but worried about the steep price tag associated with these machines? Well, the good people at DeLonghi have answered your prayers! Let’s face it, splurging hundreds, or even thousands, of dollars on a coffee maker really isn’t an option for most households. But then again, having the freedom to pull a shot of espresso from the comfort of your kitchen is the stuff of any coffee junkie’s dream. 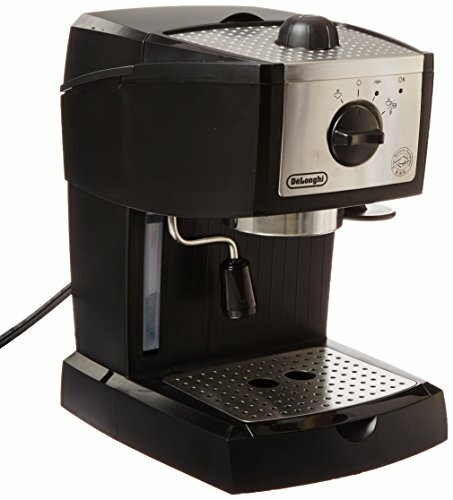 And this De'Longhi EC155 15 BAR Pump Espresso and Cappuccino Maker strikes that perfect balance between price and functionality. Coming in under a $100, this baby comes with features that would make even the fanciest of Juras a little green with envy, promising to brew brilliant coffee and pull a perfect shot of espresso. And it’s no wonder that this little guy has garnered quite the cult following. But is it worth the hype? Well, let us get on with this Delonghi EC 155 review and find out! 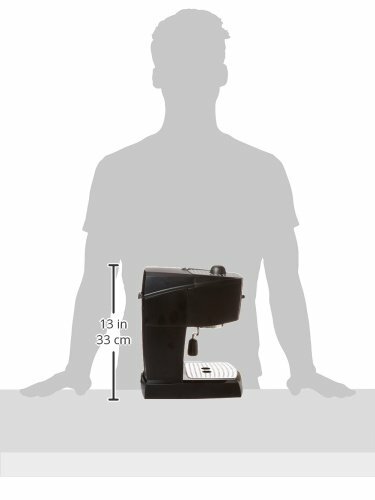 Compared to other espresso makers out there, the EC 155 DeLonghi is tiny! Just how tiny? Well, it measures just 8 x 11 x 10 inches, which makes it perfect for those short on counter space. It doesn’t have the premium finishing and knee-weakening aesthetics you think about when envisioning an espresso maker. But that doesn’t mean it is flimsy. The plastic casing complemented by a bit of stainless steel feels durable and very well-made. Crammed under that minimalist footprint are a 35-ounce water tank, stainless steel boiler, and even a 15-bar pump. Yup, that’s right. A bar pump in a sub $100 machine. That’s unheard of! Most coffee makers at this price point are steam-driven, so the engineers at DeLonghi need a raise for coming up with this. There are a couple of extra touches that make this DeLonghi pretty special. Like the in-built tamper, cappuccino frothing wand, and even dual thermostats to separately control water and steam pressure. All these join forces to make for some pretty effortless operation. Filter Holder: One of the highlights of this machine lies in the dual-action filter holder. Thanks to some pretty clever design, you can opt to use ground coffee or go for pods to make your life even easier. The filter holder has some nice weight to it but can easily get damaged in the filter head if twisted too tightly. So don’t put all your pilates training to work here. Dual Thermostats: As we’ve mentioned, the dual thermostats on this little guy allow you to separately control water and steam pressure; something pricier machines lack. What this extra control culminates in is the ability to brew espresso and cappuccino at an exact temperature that makes your taste buds feel like they won the lottery. Self Priming: You see the painstaking preparation that barista you secretly have a crush on goes through to pull just one shot of espresso? Well, you won’t have to worry about that with the EC 155. There’s a self priming mechanism built in, which readies the machine without you ever having to break a sweat. Thanks to the self priming feature, this DeLonghi is no slouch. It’s ready to go in about a minute, which makes it perfect for those hectic mornings when it seems like there aren’t enough seconds in a minute. The 35-ounce water tank is sizable enough to pull about 8-10 shots of espresso, enough to get you buzzed up and ready for the day. You’ll also love just how easy it is to remove and clean. It takes a bit of time to get used to the built-in tamper that requires you to press upwards for the grounds in the filter holder to be nicely packed. It’s just much easier to buy a separate one that doesn’t need so many cerebral resources to get the job done; because c’mon, it’s just coffee. Probably the one thing that this espresso maker didn’t get right was the length of the frothing wand; it’s just too short! But with a smaller pitcher, you’ll be able to navigate around this. The froth produced won’t be winning any awards any time soon, but it’s enough to whip up a pretty decent cappuccino. You won’t have to read DeLonghi espresso machine reviews to figure out how to disassemble this baby. Everything comes apart pretty intuitively for easy cleaning. The grounds basket does get soupy though, especially if you don’t tamp the grounds correctly while getting your brew on. PRO TIP: If you’re a cappuccino fanatic, you’ll obviously make great use of the frothing wand that this bad boy comes with. But with only a clearance of 3 ¼ inches from the counter top, you’ll need a smaller pitcher to perfectly get the job done. Go for one with a capacity of about 12 oz and you’ll be just fine. Compact size and durable feel. Can be a bit messy to clean up. The phrase 'value for money’ gets thrown around a lot, but the DeLonghi EC 155 pump espresso maker gives authentic meaning to it. 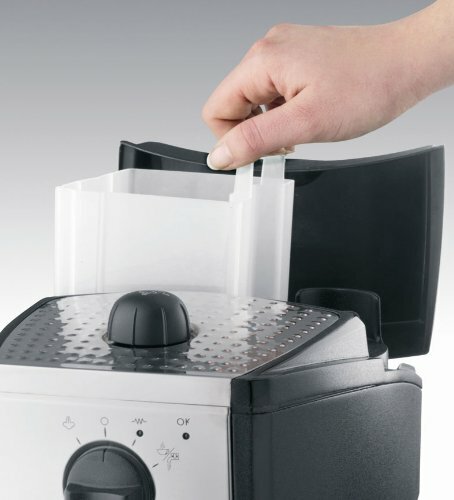 For around $100, you get a well-made machine with functionality that rivals products three times its price. It’s not without its flaws, it might not be the prettiest one in the land, but fact is, it works brilliantly. And is the #1 Best Seller on Amazon. So if you’re sitting there, reading DeLonghi espresso maker reviews, wondering if you should make the plunge, it’s really simple: do yourself a huge favor and get yourself one of these. You surely won’t regret it. We want to hear from you! 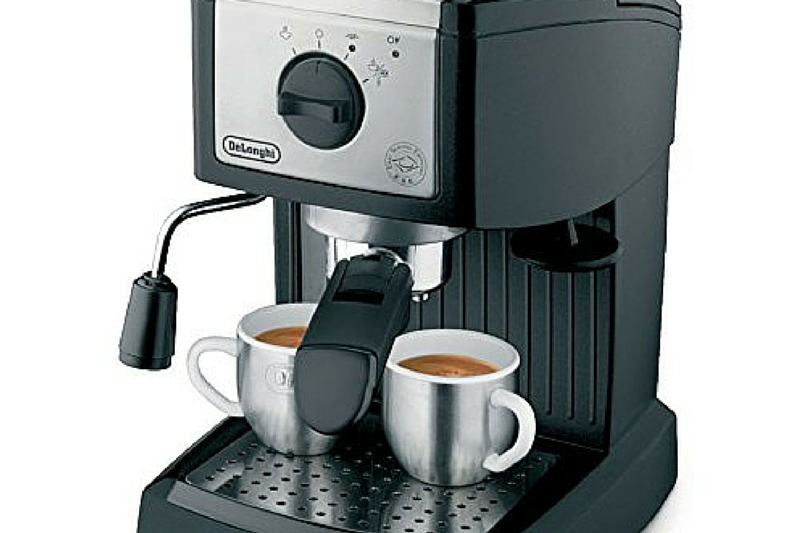 Have you tried out the De'Longhi EC155 Espresso & Cappuccino Maker?